SAE International offers a new webinar presentation which delves into the use of Fourier Transform InfraRed (FTIR) spectroscopy in automotive adhesives analysis. This 30-minute webinar will summarize the analytical capability of adhesives by FTIR spectroscopy. 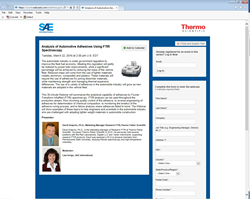 Sponsored by Thermo Scientific, “Analysis of Automotive Adhesives Using FTIR Spectroscopy” will be held Tuesday, March 22 at 2 p.m. U.S. EDT. The automobile industry is under government regulation to improve the fleet fuel economy. Meeting this regulation will partly be realized by power train improvements, while a significant percentage will be achieved by reducing the mass of the vehicle fleet. Reduced mass will come from the use of lighter materials, notably aluminum, composites and plastics. These materials will require the use of adhesives for joining dissimilar materials, while maintaining strength and managing thermal expansion differences. The use of a variety of adhesives in the automobile industry will grow as new materials are adopted in the vehicle fleet. This 30-minute webinar will summarize the analytical capability of adhesives by FTIR spectroscopy. FTIR analysis can be used throughout the production stream, from incoming quality control of the adhesive, to reverse engineering of adhesives for determination of chemical composition, to monitoring the kinetics of the adhesive curing process, and to failure analysis where adhesives failed to bond. The webinar will show examples of these topics to help engineers and scientists in the automobile industry who are challenged with adopting lighter weight materials in automobile construction. Attendees will be invited to ask questions during the webinar’s Q&A segment. David Drapcho, PhD, Marketing Manager Research FTIR, Thermo Fisher Scientific. Drapcho joined Thermo Fisher Scientific in 2010. He previously held several positions with Bio-Rad Laboratories, Digilab LLC and Varian Instruments, supporting research FTIR products. He was awarded a PhDin physical chemistry from Pennsylvania State University, studying Raman spectroscopy and high temperature chemistry. To register for the presentation, “Analysis of Automotive Adhesives Using FTIR Spectroscopy,” visit https://event.webcasts.com/starthere.jsp?ei=1091748. Click HERE to find the start time at your location.